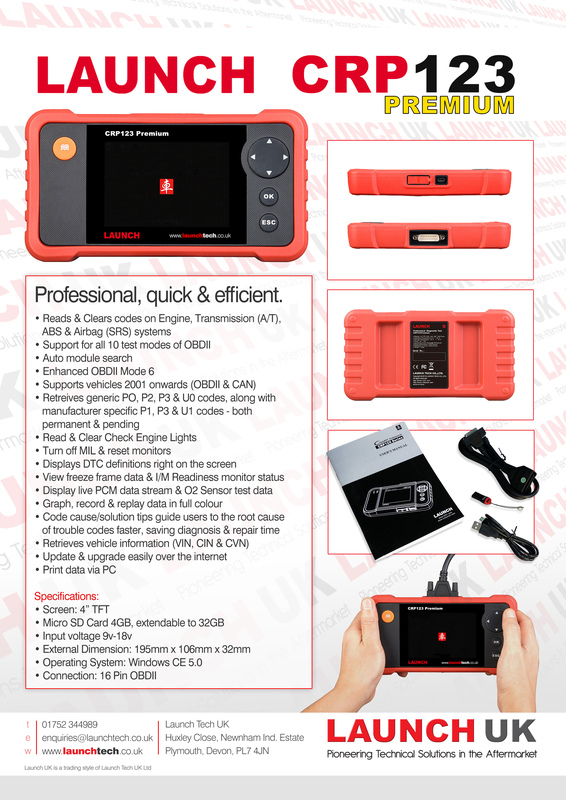 The Launch Code Reader Professional CRP123 Premium Edition is a handheld diagnostic tool used to detect and report the cause of vehicle faults. It boasts state-of-the-art hardware and software making it one of the most accurate diagnostic tool in today’s market. All this along with its compact design and full colour screen, the CRP123 Premium is easy to use and understand while not being in the least bit cumbersome. With all the operational ability of a traditional ARS/SRS Code Reader the CRP123 Premium boasts a great deal more functionality such as live data streams, coverage for Asian, European and American vehicles and the ability to scan transmissions. Intuitive interface & button operation with sleek, rugged design. If the CRP123 Premium does not meet your requirements take a look at the CReader CRP129, which has all the abilities of the CRP123 Premium and adds, EPB reset, Oil Reset and Steering Angle Reset. Unlike the vast majority of other sellers who will only offer a one year warranty, Launch UK are offering an exclusive two year UK warranty on this unit. A guide to registering your device. You can vist our update page for this diagnostic tool here. For a comparison of all of our diagnostic tools and to see which one is right for you, please click here. very pleased with unit,have not had the chance to use it to its full potential but seems a reliable unit.